We are delighted that you are considering getting married in the church. Christians believe that marriage is a gift from God. In the marriage ceremony, a couple make a public declaration of lifelong commitment to love each other. Below is our guide to getting married at St. Mary’s. Please contact our Parish Administrator for more information. If none of the above applies, and you still wish to be married in this Parish, you will need to obtain the priest in charges permission to apply for an Archbishop’s Licence (often called a ‘Special Licence’). You will need to arrange to see Simon Talbott in order to discuss and agree this procedure. There is an additional charge involved, paid directly to the Faculty Office in Westminster. How do we book the church? St Martin’s church can comfortably seat 180 people. Marriages can be arranged on any day between 8.00am and 6.00pm, (including Sundays), subject to the Church being available. One of us is Catholic. Does that matter? You will be welcome. It does not matter from the perspective of the Church of England. However, if you want the Roman Catholic Church to recognise your marriage, you will need to seek the advice of your Roman Catholic Priest. See interchurchfamilies for more information. One of us has been married before. What do we do? You are welcome. You will be asked to discuss your situation with Simon Talbott. Please make an appointment before you make other arrangements. Do we both have to be Christian? In brief, no. However, you are welcome to discuss it with the Simon if you have questions to ask. Does the Church arrange Marriage Preparation? Yes. We do this, usually by whoever is presiding at the marriage meeting with the couple for two or three sessions before the wedding. Most weddings are preceded by the ‘calling of Banns’. This means that an announcement is made at a main service in church to allow any objections to be made. This has to be done within three months of the wedding. We will tell you the dates which will normally be about two months ahead. The Banns are called on three consecutive Sundays at our 10am Parish Communion. You will be welcome to come and hear them. Your Banns will also need to be called if one of you lives in another parish at that Parish Church. This will be explained to you. Not every marriage can be celebrated following Banns. In some circumstances a Special Licence, a Common Licence or even a Superintendent Registrar’s Certificate is needed. You will be told if any of these apply to you. Under normal circumstances you do not need to go to the Registrar’s Office as Church of England clergy are Registrars for marriages. If either or both of you are in the Armed Forces, special arrangements apply. These will be explained to you. There is no doubt that the choices you make about your wedding can make an impact on the cost. If you choose to marry in church, we want it to be a day that is personal and special for you, but that need not mean you spend a fortune. The basic cost of a wedding service which includes the legalities is approximately £500. Extra flowers, an organist, bell ringers etc are optional additions that can be provided by the church. Please speak to the Parish Administrator for an up-to-date list of costs. An invoice will be sent to you two months before the wedding, with payment due one month before your marriage. Yes, of course. The priest taking the service will be pleased to discuss the order of service, the readings, and the prayers. All your guests can have a copy of the service in full, if that is desired. Many couples print a simplified order with hymns and other details. It is essential that the priest taking the service has a chance to see the text before it is finally printed. There are some copyright restrictions, but the church has a Licence to overcome these issues. The Licence number must be printed on the service sheet. Older hymns are usually out of copyright, but newer ones have restrictions. There is no need to print orders of service if you do not want to. The church can provide hymn books. How can we arrange the music? Our organist, Kim Lane, will be happy to discuss and advise on music for the service, as well as helping with the choice of hymns. Kim will also be able to advise on organ music. Please contact Kim on 01638 603193 for details. Yes. We have a bell tower with an excellent set of bells. 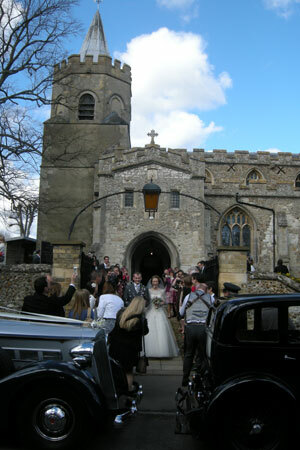 The bells can be rung before and after the service or just after the service. Please contact Norma Coggins, our Parish Administrator. How about access and facilities? If wheeled or flat access to the church is required, cars can be parked in Church St. There is level access into the main door of the church. There are fully accessible toilets in the Community Room, which will be available for the duration of your wedding. Additional parking may be available by arrangement with the school, please speak to the Parish Administrator for details. Yes, subject to a Video permission fee, currently £30. Much of the material you record will be subject to copyright – that means your video material may never be sold or shown in public. The person taking your video must talk to the priest before the service begins and it is most important that the service is not disturbed in any way. Do we have a rehearsal? Yes, there is almost always a rehearsal arranged a few days before the wedding. This will be open to all those taking part in the service, if they are available. If a key person cannot be present at the rehearsal, instructions can be passed on to them. What about flowers in the church? There is always a modest flower arrangement in church for the weekend. There will be an extra charge if you ask for more flowers. Please contact the Parish Administrator to discuss – 01223 842598. If you wished to use your own florist, this is perfectly acceptable, please arrange access via the Parish Administrator. Please note that no nails, screws or other fixings that will damage the fabric of the building may be used. If you are getting married elsewhere or you wish to renew your wedding vows, then a special service can be arranged. Any of the services above can incorporate Holy Communion if desired. Please discuss this with the priest in charge. The Church of England publishes some advice about Weddings on its national website.